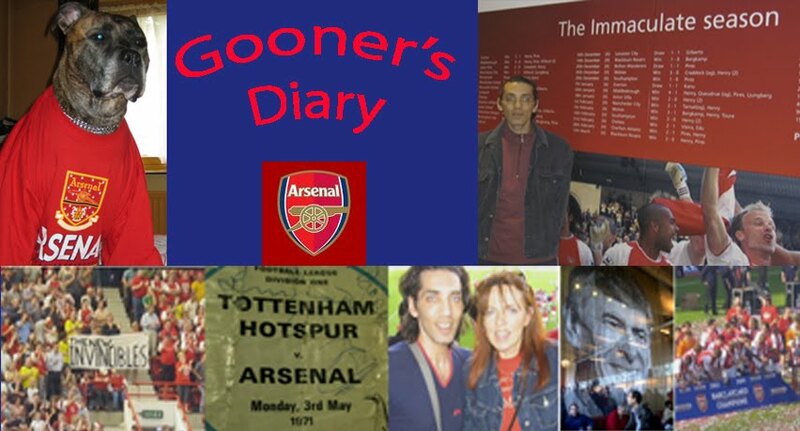 Gooner's Diary: Oh East London Was Full Of Grit…..! The fact that Matty Flamini was once again most people’s Man of the Match for the Gunners, just about summed up Saturday’s performance. Although most of us spent the second half fretting about the fact that we felt we were always going to need a second goal to win this game, after gifting West Ham all six points last season, it was great to discover that our young guns are capable of grinding out a gritty, old-fashioned “1-0 to the Arsenal”. To my mind, the unsung Flamini and our two full-backs have been our best players of the season so far, which is basically a reflection on how much more we should be able to expect from this side, as hopefully the mood of confidence surging through the camp with our current unbeaten streak, results in others in the squad beginning to hit a similar streak of form. Meanwhile it was a reflection on West Ham’s work rate and commitment that neither Clichy or Sagna made much of an impression on Saturday (apart, as far as I can recall, from Clichy’s long range shot with his weaker right foot). 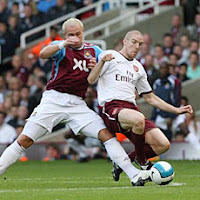 What’s more I was quite impressed with Dean Ashton. 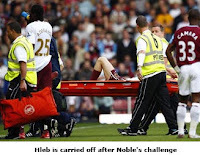 Despite the fact that West Ham fans still consider him some way from full-fitness “with the turning speed of an oil tanker”, Ashton managed to trouble both Senderos and Kolo, winning almost everything lumped into the penalty box and perhaps looking like the real deal as far as an England career is concerned. In truth the Hammers had some cause to feel hard done by, as aside from the fact the Freddie was onside when he received the ball before scoring, I thought that the pass came off Kolo, which I guess meant that it shouldn’t have mattered where he was. Mind you it was only two great second half saves from Green which kept the Hammers in the game and I was relieved that they appeared to run out of steam a little bit towards the end, as I was convinced they were going to nick a late equaliser. Upton Park might have lost some of its renowned intensity since the main stand was moved back several feet and as a result, I imagine it’s no longer quite such an intimidating place for visiting teams, because the home fans aren’t nearly so “in yer face” as they once were. Yet it remains one of my favourite awayday outings. Mind you I can only assume it’s the preparations for the London Olympics, or the Channel Tunnel rail-link which impinged upon my short hop through the industrial wastelands of East London and my enjoyment of the radio coverage of Man City v Newcastle, as I made my way to the Boleyn on auto-pilot on Saturday. I was somewhat flummoxed to find my customary route through all the back streets blocked by road closures, which forced me to turn the car around and to have to think of an alternative. It wasn’t long before I started to panic about missing kick-off, as I ended up inching my way towards the Bow Interchange, caught up in the almost permanent queues of traffic that seem to exist on the dreaded section of motorway that leads to the Blackwall Tunnel. Mercifully I managed to negotiate the eyesore that is Stratford,(London E15, as opposed to Upon Avon, Shakespeare’s far more salubrious domain) which will require one helluva facelift if it’s to become the least bit beautified by 2012! On eventually approaching my usual parking pitch at Upton Park, I was relieved to discover (as I am every season) that Newham continues to be just about the only London borough that hasn’t cottoned on to the ridiculous amount of revenue, waiting to be realised by enforcing the sort of rigorous residential parking restrictions that are the bane of every driver in the capital. Even after the circuitous stroll, forced upon visiting fans, all around the houses, to the entrance at the far corner of the Centenary Stand, I still managed to buy my matchday programme and make it to my seat, before a ball had been kicked in anger. I appreciate West Ham’s need to maximise their limited income, but at an outrageous £3.50, theirs is probably the most expensive half-time read in the Premiership. If they can get away with it, you can be darn sure other clubs will soon follow suit, by stinging the football tourists for the traditional souvenir of their visit. However what was once a fairly painless superstition, is fast becoming an over-priced obsession, for those of us addicts who are convinced we can’t win without all the essential ingredients of our matchday ritual. Seat is a bit of a misnomer for my pitch behind the goal on Saturday, as the only time I actually sat in it was when trying to sneak a surreptitious half-time ciggie. Being stuck right at the very back of the lower tier, it was easy to get away with a smoke without being caught. But the roof of the upper tier above makes the few back rows very claustrophobic and I was reluctant to add too much smoke, to the heady smell of BO, Bovril and burgers (not to mention other, more noxious human odours). Combined with the humid climate, by half-time the atmosphere was unbearably oppressive. Besides, I’m no great fan of the sort of ‘letterbox’ view of proceedings offered at the back, that leaves one having to guess where the ball is going to come down every time it’s kicked above head height and so I headed down the front towards the end of the break, hoping to find a pitch in the fresh air. Many Gooners were still gabbing out the back, or queuing for refreshments when the game recommenced. So while I waited to spy a spare seat, I could sense the steward beside me bristling and decided to strike up a conversation, before he had an opportunity to complain about me standing in the stairway. There’s a slightly dilapidated feel to the Centenary Stand, which makes it seem like it’s been in situe for a lot longer than a dozen or so seasons. But there can be no denying that there’s something about standing at a live football game that makes for a far more fervent mood than the sedentary atmosphere found at most of the Premiership’s more modern, but sadly somewhat sterile stadia. At most grounds these days, the stewards tend to hassle you to sit down if you are on your feet for any length of time and I believe persistent offenders have even been thrown out at our new place! My missus moans and I can appreciate her point of view, as it’s a problem seeing the game if you aren’t particularly tall. But from my point of view, the opportunities to stand for the duration at a top-flight football match are fewer and further between and so I make sure to savour this increasingly rare pleasure. I certainly don’t miss that warm, damp feeling down the back of ones leg, when the inconsiderate bugger behind couldn’t hang on until the final whistle and doubtless my memories are more than a little rose-tinted, but Saturday’s game was a nostalgic throwback to a time when one could spend 90 minutes hollering one’s head off, without fretting about inflicting a headache on the fragile folk in front. However my rapidly ageing bones are not averse to spending the duration of a game on my backside, but it’s when one is up and down like a jack-in-a-box which drives me bonkers, as I detest the idea of missing out on a crucial incident due to not jumping up quick enough every time the ball comes down our end of the pitch. In answer to my query about why they weren’t hassling us, the steward informed me that they only did as they were told and usually it was only when the FA inspector’s were on the prowl that they had to be seen to be making an effort to get everyone to sit down. Compared to many other clubs, it would appear that West Ham are quite enlightened, being patently aware that the more heated the atmosphere, the more likely they are to profit from their home advantage and thus they aren’t in the habit of discouraging any contributing factors, unless they have to. The Arsenal wouldn’t get away with it, as far too many of our ‘nouveau’ fans would be up in arms, as they’ve paid for a relatively luxurious, padded seat and so they’re bloody determined not to be deprived of making use of it. Modern day audiences seem to be made up of two types of supporter, those who want to sit back and enjoy their football in silence and those who are intent on participating in proceedings and who enjoy coming away from the match feeling spent, having vented a week’s worth of frustration at the officials, the opposition and even their own team. And our stadia should be able to cater for both. Sadly in spite of all the sensible protests, I can’t see it happening in this country because of perceived safety issues (albeit that to my mind the current situation is fraught with far more danger) but we’d all be much better off if we could do away with the current farce completely, by creating purpose built standing areas at every ground, such as those in Germany. Not only would this do away with all the aggravation for and from the stewards and the screams of “si’down” every few minutes (although I must admit that I’ve been inclined to join in myself when Róna’s struggling to see), but at a time when we’re constantly bemoaning the fact that the once famous walls of sound, from terraces like the Kop and the Gallowgate, are turning week by week into a timid whisper, these areas might act as a focal point to inspire everyone else to open their gobs and perhaps stem this inexorable tide towards corporate graveyards, encouraging the return at some of our grounds, to at least something of the cauldron of noise for which they were once so renowned. I finally found an empty pitch right down at the front for the second half on Saturday and I stood there trying to avoid the gaze of the geezer beside me, for fear he’d tell me his mate would be back any moment. Until I turned to discover it was someone I knew, in the exact same boat and who’d also been hoping I wasn’t about to tell him to bugger off back to his own seat. It was only then that I relaxed and focused on the footie, but unfortunately what had started out as frantic, full-blooded London derby, began to fizzle out, as we Gooners grew more nervous, certain that one goal wasn’t going to be sufficient and the Hammers fans began to lose hope, believing their best chances had been and gone. I had to forego the opportunity to earn a small fortune, for a lucrative day’s work, in order to go to Saturday’s game and it’s bad enough knowing my wage packet will be lighter than everyone else’s come Friday. But my life positively wouldn’t have been worth living if I’d passed on this job, only to face a barrage of merciless teasing from the Hammers fans at work on Monday, if we’d ended up blowing all three points. Instead of which, I guess I can’t complain, as we’re still top of the league and I’ve managed to survive thus far, without getting the sack from my claret & blue boss! Bril article, keep up the good work.